Part 24 of 31 in our NHL previews where Burgess, Waind and I rank each NHL team 1 through 31 and give you an outlook on their season. Each of our previews will be given to you in order of where we collectively power ranked that team. The Anaheim Ducks are coming off yet another impressive season, which saw them on top of the Pacific Division standings for the fifth consecutive year. But unlike 2015-16, the Ducks were able to force their way back to the Western Conference Finals after a sweep of the Calgary Flames and a seven game series win over the electrifying Edmonton Oilers. Although the Ducks fell to the Predators in six games, they proved that they still belonged that deep in the playoffs. Ryan Getzlaf had a resurgent year and an incredible postseason, while Jakob Silfverberg and Rickard Rakell continued their upward progression. Rakell led the NHL in game winning goals and was fifth in even strength goals and Silfverberg posted a career high 23 goals and 49 points. 2016-17 was the first season that goalie John Gibson was the clear-cut number one, following the trade of Frederik Andersen the offseason prior. Gibson managed to post a career best .924 save percentage which was good for fifth in the NHL. The Ducks defense did a great job limiting goals against all season, and head coach Randy Carlyle is clearly more comfortable in Anaheim. Although this team didn’t manage to get over the hump and reach the finals, there’s reason to believe they could be back. The Ducks core is untouched, with simply a collection of fringe pieces leaving town. The loss of Shea Theodore stings, but that only happened because of how deep they were on defense already, and that hasn’t changed. I’m a fan of the Ryan Miller pickup, because it follows the model that the Pittsburgh Penguins have used over their past two cup winning seasons by creating their own two-headed goalie monster. Goalie injuries happen, and goaltending is so so so important come playoff time. John Gibson is the guy, but Miller is now arguably the best and most experienced back up goalie in the NHL. With the collection of talented players up front (ie. Getzlaf, Rakell, Silfverberg, Corey Perry) the Ducks should be able to score enough, but this team is all about their strengths on defense and in goal. Their strengths are good enough that they could find themselves at the top of the Pacific Division for the 6th year in a row. Ryan Getzlaf was a stud, is a stud and will continue to be a stud. It seems like people forget how good this guy is. It’s true that linemate Corey Perry has experienced a notable regression from his peak production over the past few years, but don’t make the mistake of lumping Getzlaf in with that narrative. Getzlaf bounced back from a “disappointing” 63 point year and put up 73 points last season with 15 goals and 58 assists. If last season’s playoffs are any indication, he has plenty left in the tank. Getzlaf operated at over a point per-game pace in the playoffs racking up 8 goals and 11 assists in 17 games. He is the captain, and he led his team by example all the way to game 6 of the Western Conference Finals. The Ducks have a great core, with a balance of talented veterans and young players at each position, so they have a real chance to make another deep run again this season. The man at the centre of it all? That would be Ryan Getzlaf. The Ducks have an embarrassment of riches when it comes to young defenseman. This was evident when they had no choice but to lose talented 22 year-old Shea Theodore via the expansion draft as a condition for the Knights taking on Clayton Stoner and his bad contract. But even with the loss of Theodore and Stoner from their blue line, the Ducks remain one of the most talented and deep teams when it comes to defensemen. A group of Francois Beauchemin, Kevin Bieksa, Cam Fowler, Hampus Lindholm, Josh Manson, Jaycob Megna, Brandon Montour and Sami Vatanen doesn’t appear to have any stand out stars. But it’s a group of eight guys that can each bring different things to the table and provide solid minutes for their team. And for a team that gave up the third least amount of goals in the NHL last season, it’s looking quite clear that that will be the trend for them and not a blip on the radar as Fowler, Lindholm, Manson, Megna, Montour and Vatanen are between 23-26 years of age. While the Ducks defense is a clear strength, they would in a lot more trouble if it wasn’t as deep as it is because of the rate in which they’re sustaining injuries. Lindholm and Vatanen have opened the season on the injured reserve (IR), and Fowler recently sustained a knee injury that’ll keep him out of action for at least 4-6 weeks. As for the forwards, Patrick Eaves has only managed to play two of the team’s first seven games, while Ryan Kesler isn’t expected to come off the IR until January after undergoing hip surgery in the offseason. Finally, we have the goaltenders, free agent signing Ryan Miller also began the season on the IR, but it doesn’t appear like he’ll be out for too much longer. 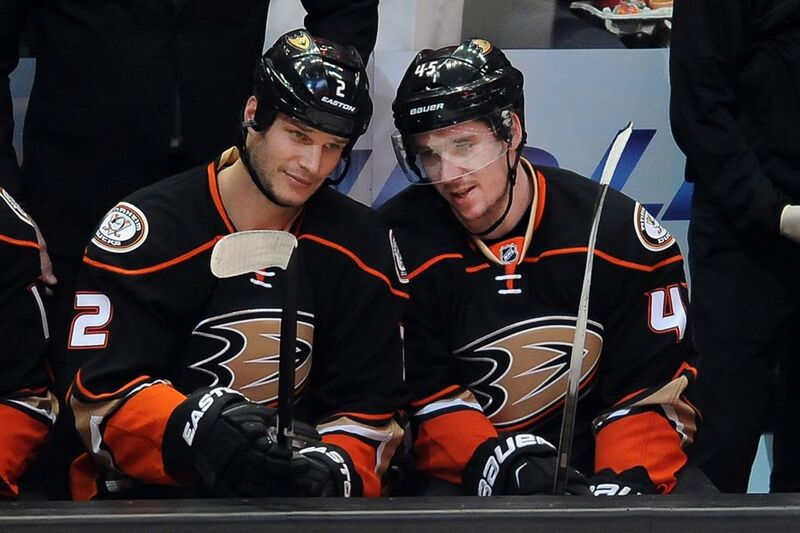 Obviously the Ducks are having some injury troubles, and with some key players too. But injuries happen to all teams at some point or another, so it can’t be a major excuse, although they’re at current disadvantage nonetheless. The positive for them is that they’re a deep enough team to manage the situation until these players return to full health. There are no rookies on the roster to open the season for the Ducks. Last season’s rookies Ondrej Kase, Jaycob Megna and Brandon Montour are all working their way into defined roles once again. More specifically Montour who is averaging 20-plus minutes per game in the early going of the season, but also Kase who is seeing some power-play time. Nic Kerdiles may be the first rookie we see this season for this team. Kerdiles is 23 years old and was selected 36th overall back in the 2012 draft and would likely get the call to fill in a bottom-six role. In the 2016 NHL draft, the Ducks had two late first round picks and used them on American left-winger Max Jones (24th overall) and Canadian centreman Sam Steel (30th overall). Jones is pegged as a power forward type, standing at 6’3” 203lbs, while Steel is a smaller high skill type of player. Keep your eye out for both at this winter’s World Junior Championship. Rakell is coming off a breakout year that saw him set career highs in both goals (33) and points (51), we should also note he still put out those totals in spite of missing 11 games. Gone are the days where Corey Perry is scoring 50 goals and leading the Ducks in that department. When it comes to putting the puck in the net in Anaheim, Rakell is the man, as his 33 last year was ten more than Jakob Silfverberg’s 23, which was enough for second most on the team. Rakell is just 24, but he’s seeing top line minutes at even strength and on the powerplay, so there’s no reason to think that he shouldn’t produce a goal total like last season’s once again. It’s a key for the Ducks that Rakell continues his upward offensive trajectory and grows as an offensive leader for them this season. The Ducks could’ve realistically been the team to represent the West last year after giving the Predators all they could handle in that Conference Final series, and there’s no reason they couldn’t be back in the Western Conference final again after they didn’t experience much change in the offseason. Their foundation – although aging – is in place, and bringing in veteran Ryan Miller to back up John Gibson should prove to be a solid move. I’m a believer in this Ducks group; with reliable goal scorers and a tight defensive system already in place, this Anaheim team can be one of the best in the league this season… and Randy doesn’t give sh*t what you think.